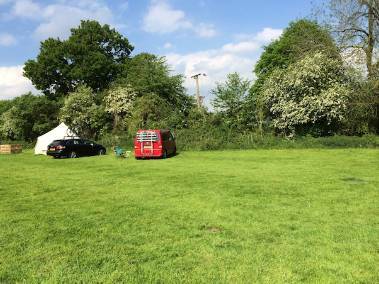 Pitch your own tent or campervan in our lovely countryside camping field, with plenty of space, and campfires allowed in fire pits. 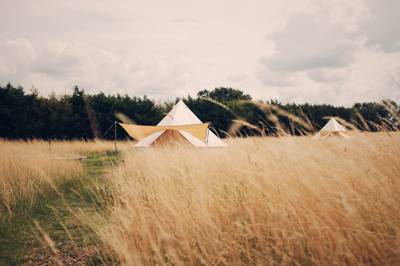 Rent an unfurnished, pre-pitched bell tent in our lovely countryside camping field, with plenty of space, and campfires allowed in fire pits. High quality Bell Tents made in the UK. The tent is 5 metre in diameter and able to accommodate up to 2 adults and 4 small children. Your Tent comes equipped with a cosy and comfy double bed and mattress. There’s astro turf throughout for extra comfort and warmth. Deep in the wilds of north Suffolk, keen camper Jonathan set up this seven-acre campsite with his dad in 2011. 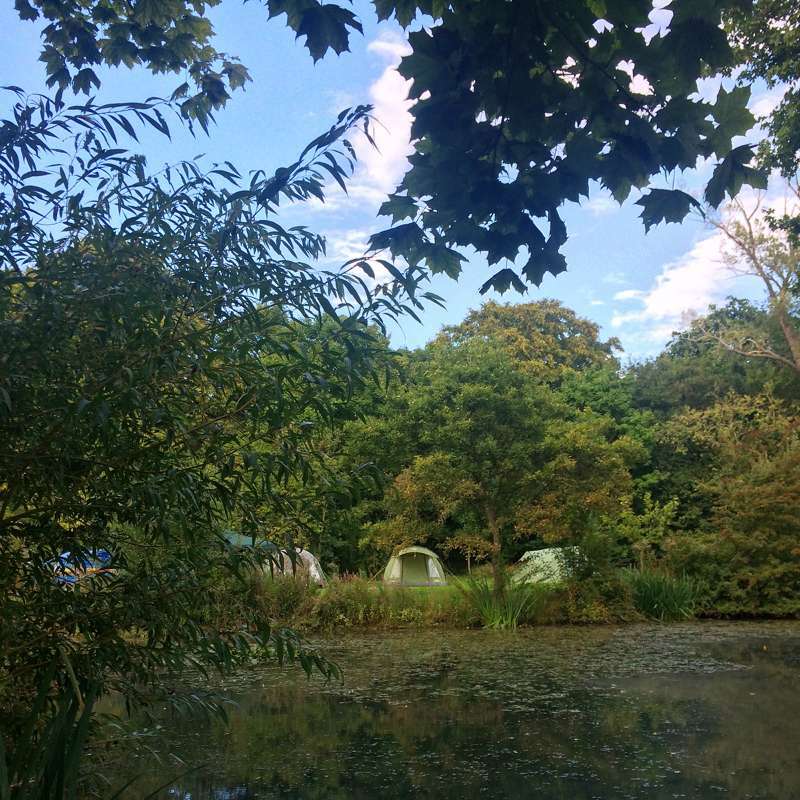 It’s a simple spot exuding a Cool Camping vibe, with two grassy fields separated by a small lake with some adjoining woodland to explore. The position is perfect for bucolic strolls across the well-marked paths and bridleways of nearby Thornham Walks and for exploring the historic Walled Garden on the adjacent estate, which has recently been restored and is open on weekends. Above all Swattesfield is a great place to simply do nothing and enjoy getting back to nature. You can erect your tent in the bottom field, spacious, green and peppered with daisies in the summer, or pitch up in the woodland beyond – ideal for those seeking a little more privacy. Glampers meanwhile have a range of options. Initially, Swattesfield kicked things off by offering boutique bell tents, complete with a full-size double bed and handy cooking facilities. Buoyed by their success, however, they then went on to build further glamping structures. Guests can now also find a pair of octagonal timber huts, with cute, peek-a-boo windows, and a converted Suffolk hay cart, refurbished to provide comfort, warmth and style while retaining its historic charm. All of the glamping units come with their own gas ring, cooking utensils, picnic bench and campfire pit, with firewood available onsite. Regular tent campers, meanwhile, are equally encouraged to keep things old-school, with firepits for use and marshmallows for sale. It’s all part of the character of the place – a character that can only be realised with an owner who clearly loves camping himself. Some of Jonathan’s mates even built him a fabulous outdoor pizza oven almost entirely out of recycled materials – definitely something to use at some point during your stay! Overall, Swattesfield is a site with a pleasantly chilled-out atmosphere situated in a very special location. The space the meadow affords could easily have been a recipe for ‘Tetris tents’ in their dozens, yet instead the opposite has been created. And, for that, we couldn’t be more grateful. Swattesfield is set in the heart of the Suffolk countryside with direct access to woodland walks and wildlife. There are two grassy fields separated by a small lake with some adjoining woodland to explore. 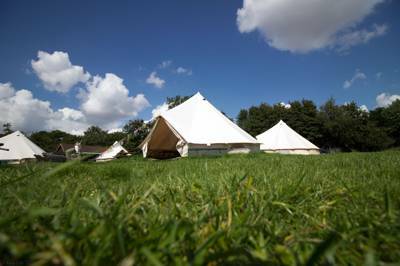 It's a seven acre site with plenty of space yet an intimate feel, with tent or campervan pitches alongside our glamping accommodation. There are no marked pitches so you can camp where you'd like; in the woods, in the glade, by the hedgerow or by the pond. We do get very busy during the holiday periods, If you are looking for a more peaceful stay we would highly recommend visiting during the off peak season or mid week. 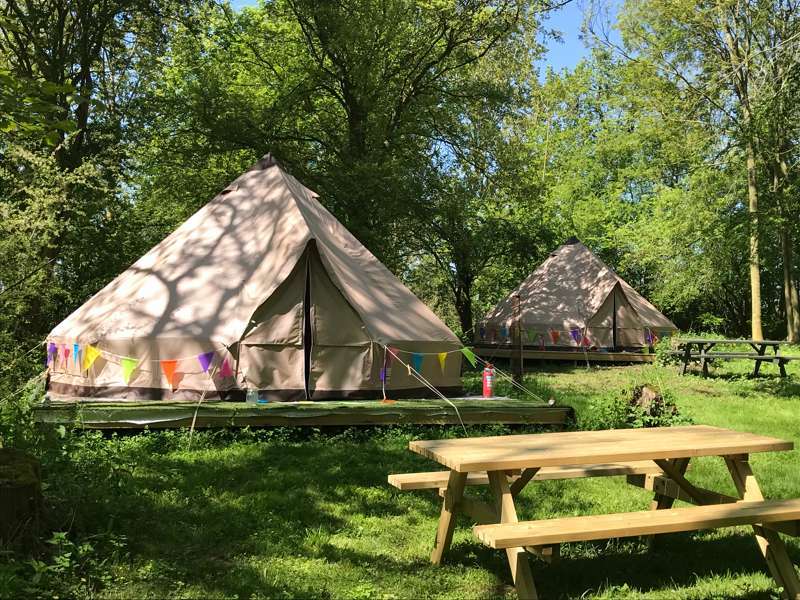 As well as the tent and camper pitches you will find a new style of Bell-Tent with all the creature comforts you'd need to have a thoroughly enjoyable stay. At five metres across with no central pole, these are big enough for four or five people and have a full-size comfy double bed as well as child beds. 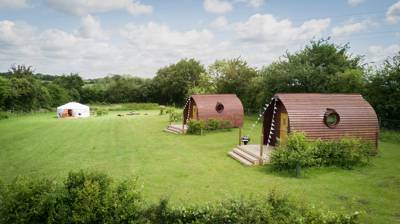 Another option are the unique Pixie Huts; These octagonal wonders have four peak-a-boo windows, a comfy full-sized double bed and two smaller foam beds for any little imps. 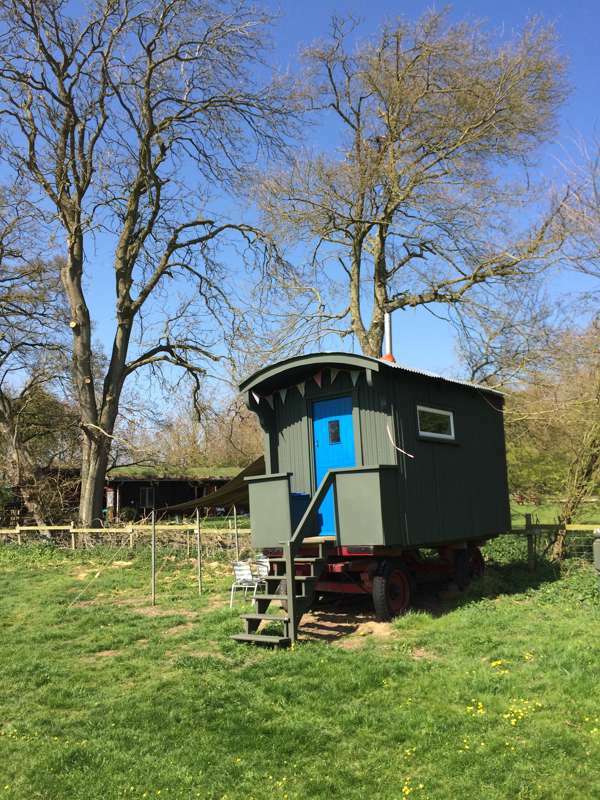 Over-looking the south facing skies of Suffolk you'll soak up the best of the sunny days, and in the cooler or wetter times just fire up the multi fuel wood burner to get the hut nice and toasty. These really are the new way to camp; cosy, cutesy and a great place to wind down and relax. 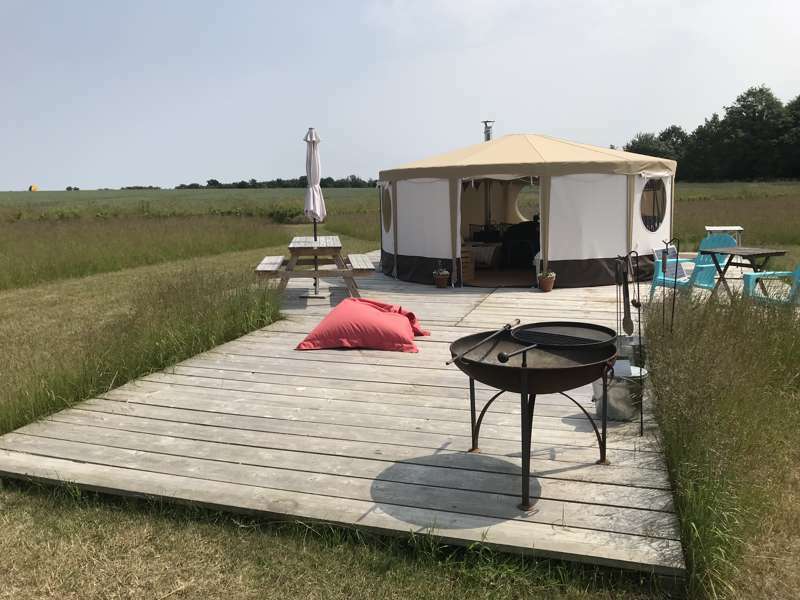 Another exclusive for Swattesfield is the converted Suffolk Hay Cart fit for two adults and two children, there is a double bed with another underneath for the kids. All your cooking equipment is supplied making the Hay Cart a real cosy camping experience especially when the stove is lit! You can still spread out onsite under your personal canopy with tables and chairs to use whilst toasting marshmallows over your fire. Open fires are allowed and encouraged but only in our fire pits, and use of our handmade Pizza Oven is free for all to use. Toilet facilities are clean and there is plenty of hot water for the four showers. There is a large outside double sink unit for pot washing and a communal kitchen with free gas, stoves, pots, pans and microwave. For latest availability and best prices for Swattesfield Campsite, please use the Date Search above. Around 20 unmarked camping pitches, 5 bell tents (sleeping 4/5), 2 pixie huts (sleeping 2 adults and 2 children) and a converted Suffolk hay cart (sleeping 2 adults and 2 children). Campfires allowed in the pits provided and there is a homemade pizza oven for use by all. No hook-ups. Simple but clean toilet block, with 4 showers, 6 sinks and 6 toilets. A small shop sells camping equipment and can re-freeze ice packs for you. Library for use and board games to borrow. A large, outside double sink unit for pot washing. Gislingham village shop is a 15-minute walk away. Get wetter and have more fun swimming in the Stowmarket (01449 674980) or Diss leisure centres (01379 652754). There’s also a child’s PlayWorld (01449 674980) at Stowmarket and ‘Monsters’ (01379 641400) in Diss, a purpose built play and party area for toddlers through to 10 year olds. Bring bikes or good walking shoes to wear the kids out or head to the playground on the local village green. Then enjoy the wildlife and the peace and quiet of this smallsville rural campsite run by a father and son team. Gislingham village shop (01379 788522) is a 15-minute walk away and there’s also a play area on the green for little ones. ‘Thornham Walks’ is directly accessible from the site – 12 miles of waymarked footpaths (open daily 9am–6pm April–Oct; shorter hours outside this period). It’s a mile and a half to Thornham Fishery (07810 653600), with 3 mature well-stocked lakes – don’t forget your rod and rod licence if you want to give it a go! By car, the Museum of East Anglian Life (01449 612229) is 20 minutes away. Set over 70 acres, there is plenty for everyone, including steam engines, a farm zoo, gypsy caravans and events throughout the year. The Thornham Estate’s Forge Tea Room (01379 783035) and Thornham Coach House (01379 783373) are a 15–20-minute walk away and serve lunch and dinner. Or try the Four Horseshoes pub (01379 678777) in nearby Thornham Magna, which serves breakfast, lunch and dinner and is about a 25-minute walk. March – end of September. Tent Pitches from £17 and Campervans from £17 per night. 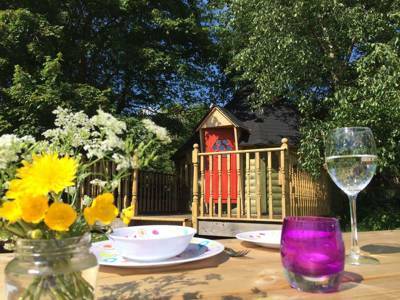 Pixie Huts from £190 per Monday to Friday or Friday to Monday break. Boutique Bell Tents from £175 per Monday to Friday or Friday to Monday break. Suffolk Hay Cart from £190 per Monday to Friday or Friday to Monday break. To find the campsite from the A140, follow the signs to the Thornham Walks and continue past the Walks entrance , continuing along Gislingham Road for about a mile and then turn right soon after seeing a 'school' sign and 'Slow' marked on the road – there is a Swattesfield Campsite sign on a tree to the left marking the entrance to the site on the right. And if you're travelling from the opposite direction through Gislingham: exit the village past the Church and towards Thornham Magna. About 1/2 mile out of the village and soon after travelling under a train tunnel you will see a 'school' sign and 'Slow' marked on the road – there is a Swattesfield Campsite sign marking the entrance which will be on the left. The nearest station is Diss (6 miles away) which is on the direct mainline from London Liverpool Street and often stops at Manningtree, Colchester, Stowmarket, Diss and Norwich. It's only an hour and a half from London and there are usually cabs waiting at the station (although we would advise to book in advance) or you can put your bike on the train and cycle.